1. Seems like the blight has gotten all around the NE states now, and is causing plants to die quickly. 2. Tomatoes seem to bit hit worse, but I suspect potatoes will go down soon. 3. Spores are everywhere and pruning off foliage that is blighted will really have no effect because there are thousands just floating in the breeze! If it would become hot and dry, things would settle down and the new blights would slow, however, given our weather forecasts, we are likely to see more blighting. 4. 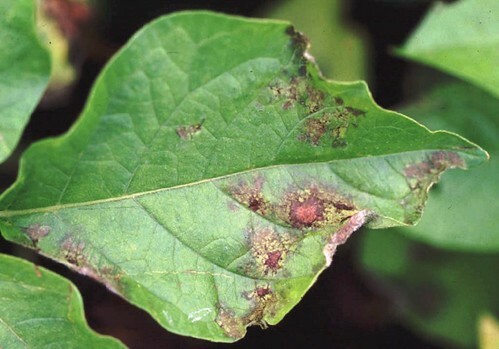 IF growers don’t see the blight in their plants, they could protect them with a fungicide (Bravo or copper for organic)on a 5-7 day schedule but the these may not keep everything protected if inoculum is high and if some infections have already started. 5. Once the grower does have late blight, it will likely take out the whole crop. Best to pull up plants, put under a tarp so all dies quickly. Can also bag and landfill, or dig hole! Other options are to til under. Don’t just leave plants standing because it will provide lots of inoculum for everyone else! The disease WILL NOT OVERWINTER on stakes, cages, on dead tissue, so that is good news for tomato growers. It will only be a problem next year if we have more storms that blow in spores, if we have contaminated plants brought in from the south, or if we have infected tubers that have overwintered. So, rotation is not that important for this disease in tomatoes, although it is for the other fungal diseases of tomatoes. 6. The only place the disease can overwinter is on infected tubers. SO if potatoes still look fine (as many do) protect with copper or other fungicide if they want. If the disease does get started in the potatoes, mow the plants BEFORE it gets very widespread, let all the tissue die (so spores die) and allow tubers to harden/suberize for a week and then harvest. If the plants were allowed to just become really blighted, there could be alot of stem cankers and this could grow down to the tubers and infect them. YOU DO NOT WANT THIS TO HAPPEN, so mow when disease gets started and all should be fine. Tubers may be a little smaller but they should be ok. Discard any that look bad at harvest. Tagged on: gardening "new england" "home gardeners" "late blight" "tomatoe blight"